On the face of it, this news is entirely unremarkable – until you realise he signed the contract just a month shy of his 52nd birthday. His records speak for themselves. According to the player’s website, he logs that he has, to date, played 38,932 minutes across his career; the equivalent of almost 27 days of continuous football. In that time he has scored 221 goals, along with 58 assists. He has also only been booked on 30 occasions and has never received a red card. Yet his story, even his name, may not be a familiar to most English football fans. 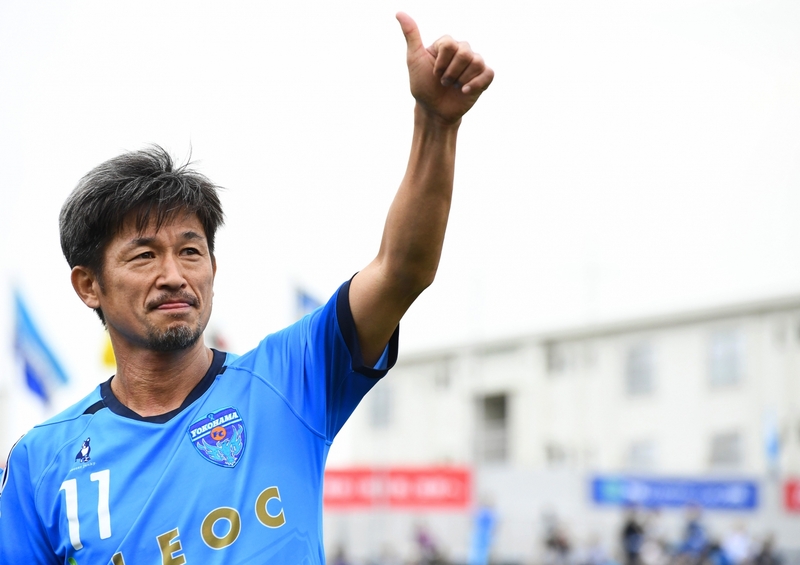 King Kazu – as he is affectionately known in Japan – is the world’s oldest professional footballer, having broken Sir Stanley Matthews’ long-held record when he made an appearance in Yokohama’s 1-1 draw with V-Varen Nagasaki in March 2017. But his presence that day would be far from the striker saying sayonara to the professional game. Born on 26 February 1967, the now slightly silver-haired frontman is entering his 33rd competitive season having started out at Brazilian size Santos back in 1986 after leaving Japan as a spritely 15-year-old. His stay at Santos would prove short, and Miura left for Palmeiras in the same year. It would be there that he would play alongside Mirandinha, the first Brazilian to play in English football when he joined Newcastle United in 1987 and who himself retired from the game in 1995. After tiptoeing his way around the Brazilian game during his formative years, Miura would return for a brief stint at Santos in 1990, before finally heading back to the Far East, where he joined Yomiuri – now known as Tokyo Verdy. The move would coincide with the initial foundations of the now acclaimed J League as the country tried to make inroads into the homegrown talent. His return to Japan saw him treated as a superstar and Miura would soon make his mark on the national side. 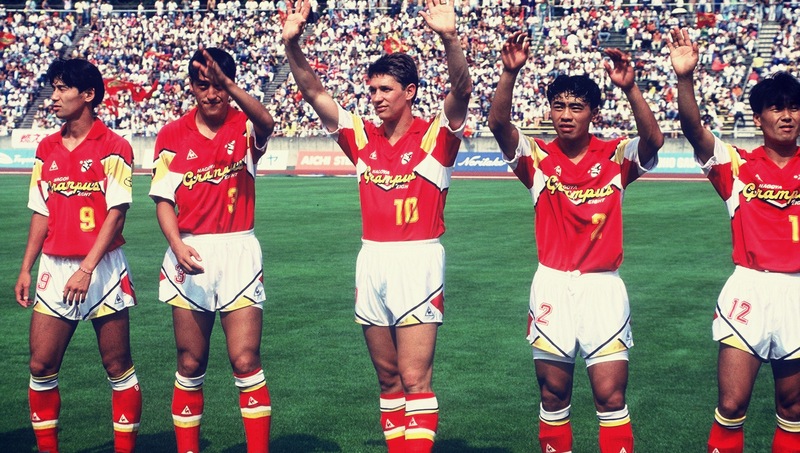 Breaking into the team in 1990, Miura scored his first goal for the Blue Samurai two years later in a 4-1 win over North Korea in the Dynasty Cup. During the 1990s, Miura’s stock would continue to rise. He became a mainstay in the national side, scoring 16 goals in 16 games during 1993, a record he would beat some four years later when he netted 18 goals in just 19 games. His form would see him go on to play for the national side until 2000 – some 19 years ago now – amassing 89 appearances and scoring an impressive 55 goals in that time. The only disappointment for Miura was that he never got the opportunity to show his talent at a World Cup. At club level, however, Miura’s career would continue on an upward trajectory. In 1993, he was top scorer and MVP of the inaugural J League season, seeing off the likes of Gary Lineker and Zico to both accolades along the way. His spell in Tokyo would last until 1998 where he managed to net 100 league goals in 192 appearances, only interrupted by a brief stint in Italy. 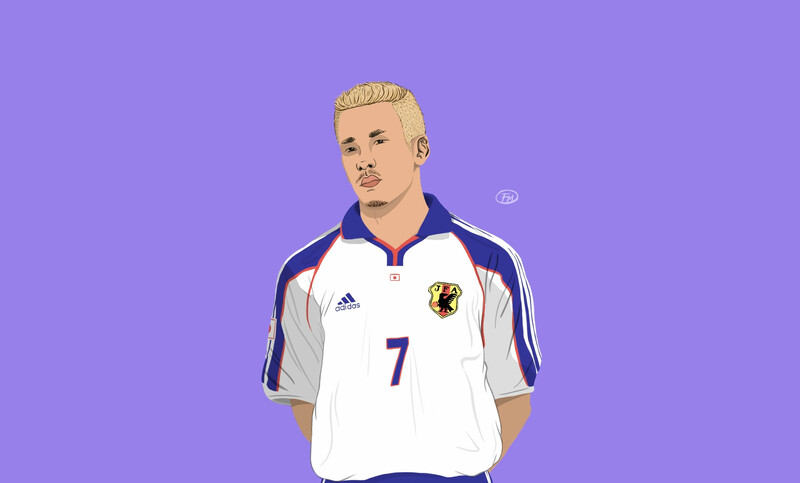 Signing on loan for Genoa during the 1994/95 season, Miura became the first Japanese player to play in Serie A, some four years before Hidetoshi Nakata would start to become a household name for his exploits the Mediterranean country. When he joined Genoa, Miura was starting to play the best football of his career. He had been named the Asian Player of the Year in 1993 and the contract he had in Tokyo was substantial for its day. But his move to the Rossoblu was not entirely linked to his footballing prowess. He was on free loan, and his wage was paid by Japanese sponsors who were interested in the European market. For instance, a reported clause within the agreement ensured Fuji Television acquired the broadcasting rights for Genoa matches and aired them in Japan. This was at a time when Serie A was hailed as the best league in the world. However, at five foot nine inches and weighing just over 70kg, Miura’s slight frame made the transition difficult. During his first match, against AC Milan in September 1994, he found himself up against one of world football’s true greats in Franco Baresi. If it wasn’t clear beforehand, it was within minutes of kick-off, when the classy Italian showed the Japanese man just what European football was all about. In the opening stages, Miura took a smack to the face but managed to play out the first 45 minutes of the game. Eventually he was taken off at half-time and sent to hospital where he was diagnosis was a fractured nose and a concussion. It could have made a lesser player question his decision to move to Italy in the first place, but Miura’s determination soon helped him settle into the European game. He returned to the field in November against Cremonese, but it was in his third match for Genoa – against rivals Sampdoria – that he etched his name into the history books, netting the first Japanese goal, not only in Italy, but in Europe. Reacting quickly, Miura broke free from his defender as the ball was nodded down into the box and into his path. With the onrushing goalkeeper – the stylish Walter Zenga – coming towards him, Miura got the faintest of touches on to the ball, nicking it over the stranded Zenga before wheeling away in jubilant celebration having given his side a 14th-minute lead. Unfortunately for him though, and for Genoa, the match would end 3-2 to Sampdoria thanks to goals from Pietro Vierchowod, Attilio Lombardo and Riccardo Maspero. It would prove to be the story of his, and the team’s, season. Genoa struggled, and while Miura made 21 Serie A appearances, the goal against Sampdoria would be his only one for the club. At the end of the campaign, Genoa were relegated to Serie B, and Miura returned to Japan. Despite the disappointing way his time in Italy ended, his time in Europe would not be over yet. In 1999 Miura made a brief switch to Croatia where he would help Dinamo Zagreb lift the Croatian First Football League title. It was a short stay but, again, he would give a good account of his abilities in Zagreb. Miura was moving again later that year, this time back to Japan with Kyoto Purple Sanga and, 12 months later, to Vissel Kobe where he’d remain until 2005. Many onlookers would have assumed Miura’s career was winding down when, at the age of 38, he signed his first deal with Yokohama. With his best years arguably behind him, and his sharpness in front of goal not what it once was – he ended up netting just six goals in his opening season with the club having played 39 times – Miura would still prove to be a popular figure with a side that had formed a mere six years earlier. That popularity would stem not only for his goals but for his personality. His trademark ‘Kazu Feint’, which would help take him around opponents and his famous ‘Kazu Dance’ – his celebration for each time he did hit the back of the net – would be cheered by the passionate Yokohama crowd. Miura’s appearances at Yokohama would begin to decline as the years went on. In 2010, he made just 10 league appearances, scoring three goals, before making 30 appearances the following year but failing to register a single goal. Since that disappointing 2011 season, Miura has not played more than 20 games in a single campaign and has only managed to find the net on nine occasions in that time. The most memorable came on 12 March 2017 when, just a week after breaking Matthew’s oldest player record, Miura surpassed the English great’s oldest goalscorer record when he netted the only goal in a 1-0 victory over Thespakusatsu Gunma. It would be unclear as the 2018 J League drew to a close if the ageing forward would receive a new deal. After all, Yokohama’s management are looking to the future of their playing squad. During 2018, for instance, Yokohama had midfielder Ryotaro Yamamoto on its books who, having been born in 1998, was over 30 years younger than his teammate. Even if only playing a bit-part role, 2019 could be another year where King Kazu continues to rule over the Japanese game and break even more records – most likely ones he’s set himself.